With one billion unique views per month, no website on the planet will come close to rivalling Google as the premier search engine of our time. 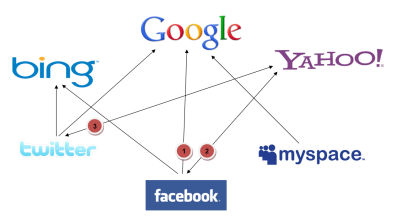 This has not stopped Internet titans like Facebook and other search engines like Bing, however, from attempting to edge in on Google`s market share by launching their social search function, a means of getting information from a search query based on who you follow and your networks. How will the launch of social search functions from major providers like Twitter and MySpace rival traditional search engines that do not peek into your network of friends and followers? The good news for many websites is that they need not alter the format of their existing SEO-oriented pages. Since social searches take place outside the realm of company landing pages and outlinks, social search optimization does not override search engine optimization. Indeed, many of the lessons applied to SEO may be used for social media optimization. These lessons include, but are not limited to, making the profiles as full, content-rich, and user-friendly as possible so that visitors to the social media page will be more likely to think highly of it and return in the future. Page owners should provide just as information on a social media site that they would have on their main site, as well as condensed information in the short description sections. Synonyms for products, services, brands, and customer experiences will allow a social search of multiple queries to return your site`s brand. Finally, links between landing page and social media pages should be prevalent and easy to see so there is no difficulty jumping from one to the other. How quickly do you forget about a status update or Tweet? Short-term memory doesn`t go much further back than about six minutes, so unless someone posts a particularly memorable update, odds are good it goes ignored and then vanishes into the forgotten past of social media. That may come to a change with social media searches, as these networks gear up the ability to look back into the past in order to come up with an answer for the present. Twitter, for instance, is opening up its archives, 140 characters at a time, for social media searches. Likewise, Facebook`s search query can go back a month, a figure that seems short now but almost certainly will be increased to months, then years, then the entire lifetime of the network. Your previous social updates might need to be clarified if they offer services, prices, or other considerations that are different than current operations. As such, a company needs to prepare for the future of the past: do keyword research for future updates so that users who search retroactively will be able to get a helpful past status update, rather than past updates being ignored because they have no value. Go into Google or Bing and type "computing store." The first entries to come up will be stores in your area. Since Google knows where you are due to your IP address, they provide personalized search results and no two different people in two different geographic areas will get the same results. Social searches will play a huge role in personalization going forward. Currently, you can modify Google search criteria to include Google+ pages, photos, and posts, but soon search engine parameters will draw upon your circles on Facebook to see how others react, on your Twitter account to see whether followers have helpful advice, to your YouTube subscriptions in case videos may address the question, to Pinterest to bring up image results, and to LinkedIn to see if companies have launched criteria to answer the question. All-encompassing search engines have been met with polarizing reactions: some love that you can get an answer to a question based on what your social circle thinks, others hate that search engines and social media now control access to information. Whatever your opinion, personalized searching is here to stay, and will soon begin to edge out traditional SEO, even if it takes a few years. A business that is looking to make their operations run smoothly and get high placement with social media searches needs to first consider their operating platforms. Social searches have the ability to drive new traffic -- sometimes a lot of new traffic -- onto a landing site. Ensure your site is up to scratch for new visitors. Have a brilliant design that makes a great first impression. Show some designs you like to a web designer. You can find excellent design inspiration on sites like www.SiteInspire.com your web host stand up to the new droves of visitors coming in because of a successful search ranking? If not, it may be time to look for a new host in order to minimize lag and ensure that a page runs without hiccups – this list on will enable you to find lots of helpful web host reviews. Develop a more aggressive social marketing campaign -- doing so usually provides a better return on investment than traditional marketing anyway -- that looks to get more shares, more likes, and more returns. Social media is, to a degree, a self-sustaining entity: good content encourages likes, which turn into shares, which turn into new likes and new shares. A company that successfully creates viral content gets more exposure than they ever could have from climbing to the top of a Google search ranking. Ensure that your page gets comprehensive reviews from users, since visitors trust online reviews just as much as in-person recommendations, even if they will never meet the person who gave the review. Don’t be afraid of having negative or neutral reviews in there as it makes realise that you have a real website with real customers. Finally, make sure a social media page has as much information as a landing page, with links to and from each site. Social search is changing search engines, arguably for the better. They’re being tailored to find what you’re likely to be interested in. Social search certainly appears to be the way forward, with numerous social media sites also latching onto it too, it’s now not just the search engines that have and are still changing. With Google’s heavy reliance on social and Bing’s moves into social search too, search engines will certainly continue to evolve and merge with social.